It’s hard to believe, but it’s once again time to start working on your taxes. No matter how many times we've filed before, this date always seems to sneak up on us. However, it doesn't need to be a stressful situation. Walking through the process step by step can ensure your taxes are both accurate and filed on time. 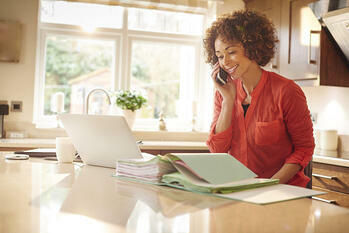 Check out some tips for filing your taxes this year. If you don’t already keep your financial information organized, now is the time to do so. This could include things like your checkbook, credit card statements, bank statements, and receipts. In January or February, you will receive a W-2 from all of the places you were employed during the previous year. Any forms you receive that are related to taxes should be kept in one single, safe place. The filing date will be here before you know it. As soon as you receive your W-2 form, spend time each week working on your taxes. If you fall behind or know there's no way you'll meet the deadline, you'll need to file an extension. Failing to file your taxes on time or not requesting a extension may result in penalties and late fees. During tax time, fraudsters will try to obtain people's financial information by posing as the IRS. They will use intimidation tactics and threats in order to get what they want. No one from the IRS will ever ask for personal information over the phone, such as credit/debit card numbers or your social security number. They will also not ask for payments in a specific form, such as a prepaid debit card. If you feel like you have encountered a scam, contact the Treasury Inspector General for Tax Administration at 1-800-366-4484. We’re pleased to offer our members leading tax preparation services at discounted prices. Click HERE to save up to $15 on TurboTax. This software makes it easy to guarantee your filings are accurate and maximize your possible deductions. After finishing your taxes, make sure you save a copy either in paper or digital form. This will come in handy if somewhere down the line you need to provide your taxes.